20111216 -Up and worked @ desk all day. L&G back to J's Christmas sing along. The boys started arriving from school and this starts their Christmas break, so they were plenty loud and excited... After work we all loaded up and head to Bellacino's for dinner. After dinner L ran into the Dollar Store to get wrapping paper and the boys and I headed into the pet store. 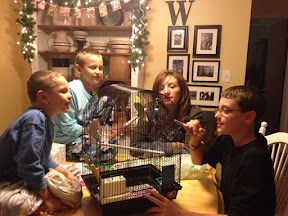 We didn't leave empty handed... :-o Home with our new feathered friend, a green and yellow parakeet. We played with our new friend a bit and then down watching a movie and then up late working on contact syncing.